Number of Unique Parts(BOM lines): The total number of the unique manufacturer part numbers in you BOM. It's the same number with BOM lines when each BOM line represents a unique part number. Number of SMT Parts: The total number of all surface mount parts on each board. Number of Through-Hole Parts: The total number of thru-holes(THT) parts on each board. Number of BGA/QFN Parts: The total number of BGA, QFN , QFP, PLCC and any others ICs more than 16pins on each board. Tips: * PCB assembly prices do not include PCB fabrication or the cost of components. * For PCB quote, please kindly click and select from the online PCB quote system. * Our PCB Assembly process is Lead-free.If you request leaded process, please inform us. * Please click here for PCB assembly capabilities& requirements. * You also could send us your PCB file,BOM file and requirement to svc@pcbastore.com for a precise quotation. Different Design in Panel: 1 2 3 4 5 e.g. 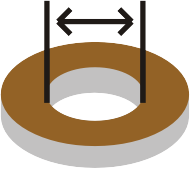 * Dimensions (single): Board dimension refers to L*W.If board is round, the size is D*D (D=Diameter). • Tip: If you have any requirement that are not listed on the online quotation form or any items can not be selected or inputted, PLS simply send the PCB files to your Sales Rep Email or svc@pcbastore.com for quotation. PCBAStore promise to keep your private information 100% safe. Payment Method:PCBAStore accept Paypal, TT, Western Union and other methods. If you order online, you could choose Paypal payment directly. If you want to pay by other method, please contact the customer service to confirm. Shipment Method:PCBAStore could offer DHL, Fedex, TNT and HongKong Post, E-packet, EMS, SF express and other more methods. Online payment only support DHL for the moment. Please contact yoursales rep to confirm if you need other shipment methods.